Using an electric assisted bike like our Charger with a specially designed passenger trailer like this could be less expensive...even more practical than the traditional non-powered pedi-cab! 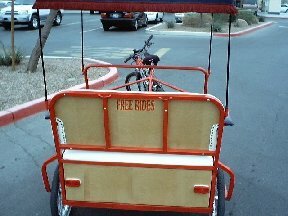 Standard pedi-cabs require more storage space than trailers...and these allow the operators to use their electric bikes for personal transportation when not moving passengers. This $1700 trailer has brakes, and a battery compartment for tail lights...and greater pedal assisted range. A canopy solar panel could help power other accessories (sound system, seat heating, illuminated ads...). Our new 1000W 48V hub motor kit shown above, makes it easy to convert most single rear wheel trikes and pedi-cabs to electric assist for less than $1000. The non powered front load cab on the left costs about $3000 plus shipping. It's a design with a low center of gravity, fairly narrow footprint, and small turning radius where the rear section leans into the curves. Lifting the handlebar activates the passenger foot rest. Three independent brakes are standard (2 front drum and 1 rear "v" pad type). With our kit, the rear could have a disk brake too, keeping the "v" as a parking brake. 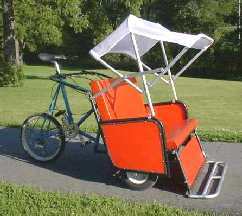 The same kit is available in an easy to install front wheel drive version for bikes, single front wheel trikes, and pedi-cabs. But it may be wise to consider using the motor in a rear drive configuration, depending on the terrain and payload requirements. 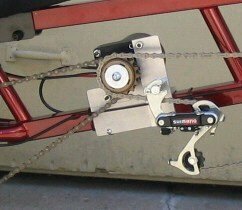 Though this involves a motor mount and chain drive to the rear axle, it may be worth the extra cost and trouble if you need the traction. It makes even more sense to consider our new "mid drive" motor system when connecting to a multi-speed pedal power gear cluster or internal gear box used on some trikes. The many "EZ-3" and "Lightfoot" recumbent trikes using our E-4 "mid-drive" are examples of how this design expands motor efficiency...as well as our human capability, while keeping weight low!!! The "quadrabent" set-up in the following link moves our system to the realm of 4 wheel cycles, which up until now have normally been direct axle or wheel drive. 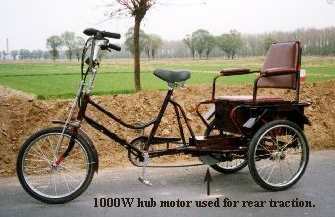 Back to e-bike conversion Kits page ! IT'S EASY TO ORDER YOUR MOTOR KIT ! 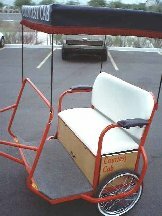 NEW !...folding e-wheel chair, and kits too!